At the beginning of 2019, gas prices were relatively low. Prices fluctuate often, however, depending on many factors. High gas prices are caused by high crude oil prices. In November 2018, oil costs accounted for 54 percent of the price of regular gasoline. The remaining 46 percent comes from distribution and marketing, refining, and taxes, which are more stable. When oil prices rise, you can expect to see the price of gas to eventually rise at the pump. Geopolitical events impact oil prices, which in turn affect gasoline prices. On May 10, 2018, global oil prices reached $80 per barrel. It followed the U.S. decision to pull out of the Iran nuclear agreement and reinstate sanctions. Production in Iran dropped through the end of 2018. In addition, Libya and Venezuela faced limited production. Oil prices also rose after the November 30, 2017, Organization of the Petroleum Exporting Countries’ meeting. The members agreed to keep production cuts through 2018. At a meeting of OPEC and non-OPEC oil-producing nations in December of 2018, they again cut production. On January 15, 2019, the Energy Information Administration released its forecast for two major crude oil benchmarks, Brent and WTI. The agency predicts that Brent will average $60.52 per barrel in 2019 and $64.76 in 2020, while the WTI will average $54.19 and $60.76. 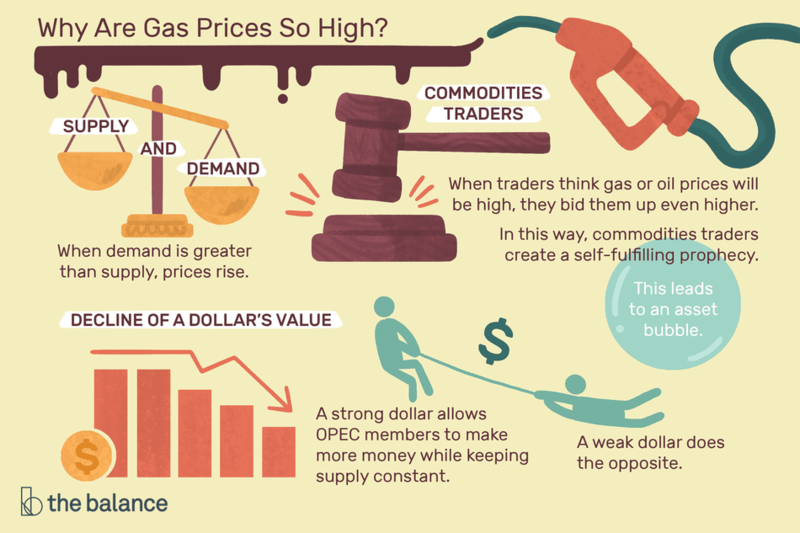 The three major causes of high gas prices are supply and demand, commodities traders, and the value of the dollar. These are also the determinants of oil prices. Supply and Demand. Like most of the things you buy, supply and demand affect both gas and oil prices. When demand is greater than supply, prices rise. For example, U.S. shale oil producers increased the oil supply in 2014. Gas prices fell to their lowest levels in five years. But that shale oil boom reversed when low prices put many producers out of business. Seasonal demand also affects oil and gas prices. You can expect them to rise every spring. Oil futures traders know the demand for gas rises in the summer as families go on vacation and hit the road. Regulations also require a shift to summer-grade gasoline, which is more expensive to produce. They start buying oil futures contracts in the spring in anticipation of that price rise. Commodities Traders. Commodities traders also cause high gas prices. They buy oil and gasoline at the commodities futures markets. Those markets allow companies to buy contracts of gasoline for future delivery at an agreed-upon price. But most traders have no intention of taking ownership of the gasoline. Instead, they plan to sell the contract for a profit. Since 2008, both gas and oil prices are affected more by the ups and downs in these futures contracts. The price depends on what buyers think the price of gas or oil will be in the future. When traders think gas or oil prices will be high, they bid them up even higher. In this way, commodities traders create a self-fulfilling prophecy. This leads to an asset bubble. Unfortunately, the one who pays for this bubble is you at the gas pump. The Value of the Dollar Declines. Gas and oil prices also rise when the value of the dollar declines. Oil contracts are all denominated in dollars. Oil prices rose between 2002 and early 2014 because the dollar lost 40 percent of its value during that time. Oil prices fell between late 2014 and 2016 in part because a strong dollar allowed OPEC members to make more money while keeping supply constant. Here's how different situations, from conflict on the world stage to engineering mishaps, affected the price of gasoline. April 2011: Fears about unrest in Libya and Egypt sent oil prices up to $113 a barrel. In May 2011, as oil prices dropped, the price at the pump stayed high. Why? Commodities traders were concerned about refinery closures due to the Mississippi River floods. February 2012: Concerns about a potential military action against Iran, by either Israel or even the United States, caused high oil prices. Second, some U.S. oil refineries were closing, according to an Environmental Impact Assessment report. Third, oil and gas prices tend to rise every spring, in anticipation of increased demand during the summer. As a result, the prices for a gallon of gasoline hit the benchmark $3.50 by February 15, two weeks earlier than in 2011. By mid-March, the national average had jumped to $3.87 a gallon. That's because, two weeks earlier as well, the price of oil reached its benchmark of $100 a barrel. Oil went on to hit $109.77 per barrel by the end of February, before dropping slightly to $107.40 per barrel in mid-March. August 2012: Prices were high as a result of Hurricane Isaac, which hit the U.S. Gulf Coast region on August 28, 2012. In anticipation of the Category 1 hurricane, refineries in the area shut down production. As a result, crude oil production lost 1.3 million barrels per day. This caused the average national price of gas to jump in one day, from $3.05 per gallon to $3.80 per gallon. Prices in Ohio, Indiana, and Illinois rose even further, as the storm closed a pipeline that feeds the Midwest. September 2012: Prices rose to an average high of $4.50 a gallon in California. That was because of supply shortage from two causes. The first was a power outage at the ExxonMobil refinery in Torrance, California. A heat wave caused the power failure. The second was a shutdown of a major north-south oil pipeline. These came on top of East Coast refinery shutdowns due to regular seasonal maintenance. March 2013: Iran started war games near the Strait of Hormuz early in 2013. Almost 20 percent of the world's oil flows through this narrow checkpoint bordering Iran and Oman. If Iran threatened to close the Strait, it would have raised the fear of a dramatic decline in oil supply. In anticipation of such a crisis, oil traders bid up the price, which reached $118.90 a barrel on February 8. Gas prices soon followed, rising to $3.85 a gallon by February 25. These rose again in August 2013 because oil prices hit a 15-month high that summer. That spike was created by political unrest in Egypt. April 2014: Prices rose in April 2014 because the price for domestic oil rose to $101 a barrel. The domestic oil price is benchmarked by the reference grade, West Texas Intermediate. Oil prices rose because new pipelines from the Cushing, Oklahoma storage hub lowered inventories to the lowest level since November 2009. In addition, the price of imported oil, a grade called the North Sea Brent, rose to $110 per barrel. This was caused by political unrest in Ukraine, Nigeria, and Iraq. The EIA expected average national prices of gasoline to remain at $3.60 a gallon until May. July 2015: In California, the price at the pump increased to almost $4 a gallon in July 2015. Midwest refinery problems sent California's oil elsewhere. Since it doesn't have major pipelines from other regions, California had to wait for tankers with imported oil to arrive. A similar issue happened in 2012. It was just a temporary regional problem. August 2015: Gas prices rose from an average of $2.58 a gallon to $2.62 a gallon. This spike was due to an outage at BP's Whiting refinery in Indiana, making prices in the Midwest higher than average. November 2016: Gas prices rose when OPEC cut production. Members agreed to reduce supply by 1.2 million barrels per day in January 2017. In response, traders bid oil prices to $51 a barrel in December 2016. That was double the 13-year low of $26.55 a barrel in January 2016. Gas prices rose for 14 consecutive days after the meeting. The national average of $2.21 per gallon was up 20 cents compared to the same time period the previous year. August 2017: During this month, average gas prices rose from $2.35 a gallon to $2.49 a gallon. Hurricane Harvey wiped out 5 percent of the nation's oil and gas production. The Department of Energy released 500,000 barrels of oil from the Strategic Petroleum Reserve. By September 5, gas prices had returned to normal. The April to September vacation-driving season often causes an increase in gas prices. But prices fall in the winter since transportation needs and production costs are lower. This price decrease even offsets an increase in home heating oil usage for winter in northern areas of the United States. Gas prices will drop when supply increases. There are a lot of ways that could happen. OPEC could decide to release more oil. The United States could lift sanctions against Iran. Shale oil producers could find another large deposit or create new technology. Prices will also fall as the dollar's value rises. OPEC can allow supply to expand since they'll remain profitable with a rising dollar. Most important is the impact all these factors have on commodities traders. If they believe oil and gas prices will fall, they won't bid up futures contracts. They may even find another investment, allowing prices to decline further. The most immediate thing we can do is reduce our usage of gas by driving less or increasing fuel efficiency. The best way to increase fuel efficiency is to keep tires inflated. Urban dwellers can use public transit. Others can move closer to work to reduce commuting time. For the long term, we can change our need for oil and gas by switching to alternative fuel vehicles. Could these actions reduce the high price of gas? They might if they were on a sustained basis over a long period of time. The only real way for consumers to lower gas prices is to lower demand for gas and oil for a sustained period. However, the demand for gasoline and fuel isn't declining, and it's unclear whether the development of alternative fuels will help. The United States consumes 20 percent of the world's oil. This has increased over the last 20 years, from 15 million barrels per day to 19.69 million barrels per day – and it's expected to keep rising, at least over the short term.